When is an internal combustion engine not an internal combustion engine? When it's been transformed into a modular reforming reactor that could make hydrogen available to power fuel cells wherever there's a natural gas supply available. By adding a catalyst, a hydrogen separating membrane and carbon dioxide sorbent to the century-old four-stroke engine cycle, researchers have demonstrated a laboratory-scale hydrogen reforming system that produces the green fuel at relatively low temperature in a process that can be scaled up or down to meet specific needs. The process could provide hydrogen at the point of use for residential fuel cells or neighborhood power plants, electricity and power production in natural-gas powered vehicles, fueling of municipal buses or other hydrogen-based vehicles, and supplementing intermittent renewable energy sources such as photovoltaics. Known as the CO2/H2 Active Membrane Piston (CHAMP) reactor, the device operates at temperatures much lower than conventional steam reforming processes, consumes substantially less water and could also operate on other fuels such as methanol or bio-derived feedstock. It also captures and concentrates carbon dioxide emissions, a by-product that now lacks a secondary use—though that could change in the future. Unlike conventional engines that run at thousands of revolutions per minute, the reactor operates at only a few cycles per minute—or more slowly—depending on the reactor scale and required rate of hydrogen production. And there are no spark plugs because there's no fuel combusted. "We already have a nationwide natural gas distribution infrastructure, so it's much better to produce hydrogen at the point of use rather than trying to distribute it," said Andrei Fedorov, a Georgia Institute of Technology professor who's been working on CHAMP since 2008. 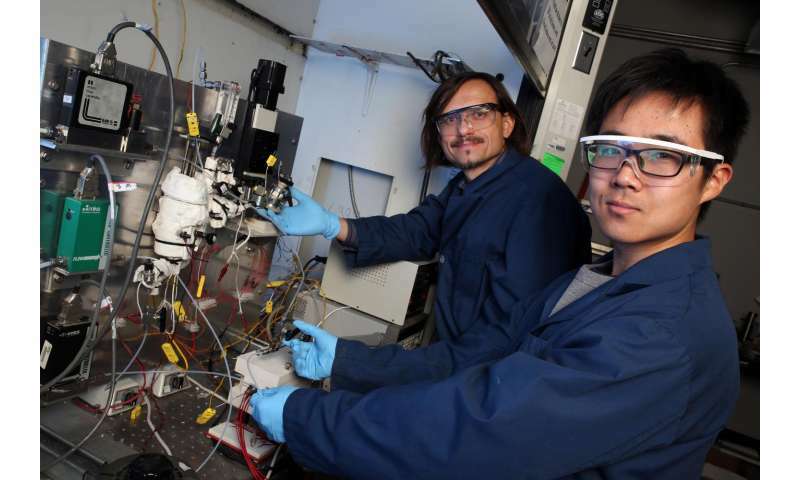 "Our technology could produce this fuel of choice wherever natural gas is available, which could resolve one of the major challenges with the hydrogen economy." A paper published February 9 in the journal Industrial & Engineering Chemistry Research describes the operating model of the CHAMP process, including a critical step of internally adsorbing carbon dioxide, a byproduct of the methane reforming process, so it can be concentrated and expelled from the reactor for capture, storage or utilization. Other implementations of the system have been reported as thesis work by three Georgia Tech Ph.D. graduates since the project began in 2008. The research was supported by the National Science Foundation, the Department of Defense through NDSEG fellowships, and the U.S. Civilian Research & Development Foundation (CRDF Global). "All of the pieces of the puzzle have come together," said Fedorov, a professor in Georgia Tech's George W. Woodruff School of Mechanical Engineering. "The challenges ahead are primarily economic in nature. Our next step would be to build a pilot-scale CHAMP reactor." Fedorov's lab first carried out thermodynamic calculations suggesting that the four-stroke process could be modified to produce hydrogen in relatively small amounts where it would be used. The goals of the research were to create a modular reforming process that could operate at between 400 and 500 degrees Celsius, use just two molecules of water for every molecule of methane to produce four hydrogen molecules, be able to scale down to meet the specific needs, and capture the resulting carbon dioxide for potential utilization or sequestration. "We wanted to completely rethink how we designed reactor systems," said Fedorov. "To gain the kind of efficiency we needed, we realized we'd need to dynamically change the volume of the reactor vessel. We looked at existing mechanical systems that could do this, and realized that this capability could be found in a system that has had more than a century of improvements: the internal combustion engine." The CHAMP system could be scaled up or down to produce the hundreds of kilograms of hydrogen per day required for a typical automotive refueling station—or a few kilograms for an individual vehicle or residential fuel cell, Fedorov said. 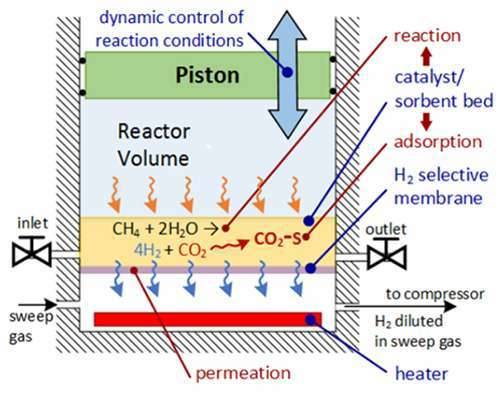 The volume and piston speed in the CHAMP reactor can be adjusted to meet hydrogen demands while matching the requirements for the carbon dioxide sorbent regeneration and separation efficiency of the hydrogen membrane. In practical use, multiple reactors would likely be operated together to produce a continuous stream of hydrogen at a desired production level. "We took the conventional chemical processing plant and created an analog using the magnificent machinery of the internal combustion engine," Fedorov said. "The reactor is scalable and modular, so you could have one module or a hundred of modules depending on how much hydrogen you needed. The processes for reforming fuel, purifying hydrogen and capturing carbon dioxide emission are all combined into one compact system." No mention of the energy loss involved in transforming an easy-to-use fuel like methane into hydrogen. That makes me suspicious that the energy loss is huge. Steam reforming consumes heat. In general there's a 10-20% loss in heating value between the input methane and output hydrogen. Internally reforming fuel cells can utilize their own waste heat to run the process, which improves the system efficiency. Externaly reforming units take the loss. That is to say, it doesn't make any sense to design and use a fuel cell that needs an external reformer to run on methane or other hydrocarbon fuel. Unless you specifically need hydrogen for some reason, it's far better to use an internally reforming SOFC and stop mucking about with the hydrogen economy. 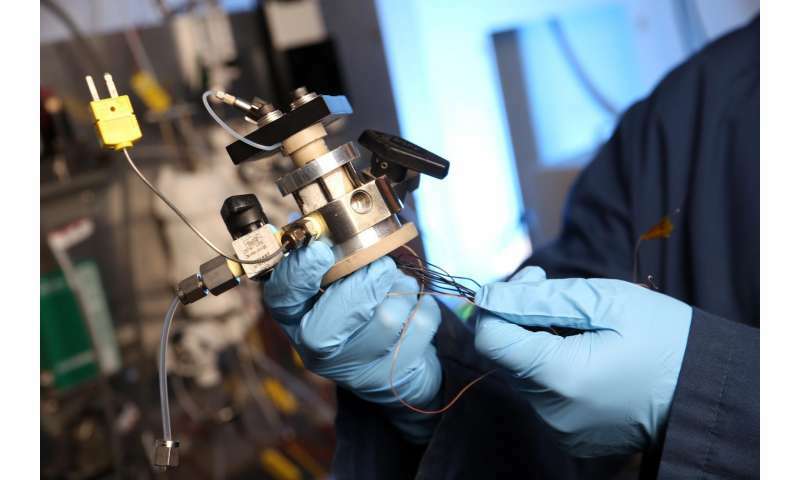 Would it be any harder to capture CO2 from an internally reforming fuel cell? Ultimately, both hydrogen and LNG/LPG are too dangerous to carry in an automobile because they have a habit of rapid release in a fire, such as inside a parking complex or a tunnel. That means, instead of reforming methane into hydrogen at the point of sale, it should be reformed into methanol or DME. Well, considering the output from the stack is pretty much just steam and CO2, I'd say it's pretty trivial. Condense the steam and you're left with pure CO2. Since the SOFC doesn't pass protons (hydrogen) through the membrane, but oxygen, they don't technically even need any hydrogen to operate. You can design an SOFC to run on carbon monoxide gas if you want to - such as from a wood gasifier running on charcoal - and the output will be plain concentrated CO2. The hydrogen economists just don't seem to like SOFCs for some reason - probably because they're too convenient and don't require major distribution system overhauls for the fuel. That seems to be the big sticking point. Billions of $$ in infrastructure and the internal combustion engine doggedly refuse to disappear so what the elite owners are waiting for is yet simpler magic. Everything out there part of the car nation infrastructure doesn't want to go away; it wants to be used and profited by.. Good Luck with that. Ultimately, both hydrogen and LNG/LPG are too dangerous to carry in an automobile because they have a habit of rapid release in a fire, such as inside a parking complex or a tunnel. You do know that LPG has been used for many years in small trucks and passenger cars don't you? LNG is now being used with large trucks to save fuel costs too. Yes I do, but that does not address the safety question at all. There's just such a small number of them that they haven't caused widespread issues. The LPG/LNG tanks have the capacity to disperse fuel very rapidly over a large volume in a very short amount of time because the pressure on the compressed liquefied gas alone carries a significant amount of potential energy. That is a problem when vehicles are placed in close proximity in enclosed spaces. LNG has the additional problem that it won't stay a liquid unless it's cooled to -162 C and it will burst out of any container as it boils away. There's no fire in it, but just look at how far and wide the cold gas spewing from the tanker truck spreads. The white cloud isn't the whole of the gas cloud - there's more dispersed everywhere around it. It's not rising up into the sky as you'd expect because the boiling and expansion of the gas makes it very cold and dense and it spreads around along the ground where it slowly mixes with air. Had there been a source of ignition, that would have been a massive disaster. Large dispersed fuel-air explosions are actually used in military capacity as a replacement for small nuclear weapons, because they provide the same knock-down effect on infrastructure without the radiation hazard. The Russian FOAB has 7 tons of fuel and a blast radius of 3000 meters (1.8 miles). This is why you don't want large amounts of liquefied gas around when there's a fire. I think re-purposing the ICE design for a no-combustion extraction of H from well gasses is awesome. Having the CO2 contained, and not part of a multi-gas plasma at 2500 degrees, means that a next stage can be designed where the C is split from the O2. Pure carbon dust is valuable for manufacturing and the O2 can be released or used for medical purposes. As many of these as are needed can take the gas right from the well head, The CO2 can be processed on the side, and the H can be fed to the large stationary fuel cell, and then onto transformers and power lines. Fuel cells still need a good amount of electricity to run, like 40kw, and that can come from a renewable source on site. It's a big production for something like a 1Mw output, but at least we can use our existing industries and resources. **I'm getting the 1Mw and 40kw # from what I remember about our local fuel cell manufacturer's product. . I haven't thought about the implications for water needs/usage. "We already have a nationwide natural gas distribution infrastructure, so it's much better to produce hydrogen at the point of use rather than trying to distribute it,"
We already have another distributing infrastructure: power lines. These also allow the creation of hydrogen at the point of use through hydrolysis. And without generating CO2 in the process. There's just such a small number of them that they haven't caused widespread issues. "Worldwide, there were 22.7 million NGVs by 2015, led by China(4.44 million), Iran (4.00 million), Pakistan (3.70 million), Argentina (2.48 million), India (1.80 million), and Brazil (1.78 million). The Asia-Pacific region leads the world with 6.8 million vehicles, followed by Latin America with 4.2 million... As of 2009, the U.S. had a fleet of 114,270 CNG vehicles, mostly buses; 147,030 vehicles running on liquefied petroleum gas (LPG); and 3,176 vehicles LNG..."
-sounds like a lot to me. "According to the U.S. Department of Energy's Alternative Fuels Data Center, natural gas vehicles are actually safer than those powered by gasoline or diesel. The fact that CNG is lighter than air further enhances its safety... A survey by the Federal Transit Administration of 8,331 natural gas utility, school, municipal, and business fleet NGVs that traveled 178.3 million miles on CNG found that the NGV fleet vehicle injury rate was 37-percent lower than the gasoline fleet vehicle rate.